When you need your pet’s hairbrush, do you end up searching through the whole house for it? When you find it, is it under the bed or worse in the refrigerator vegetable drawer? If so, you need help and if not, you probably still could do better. There are two basic ways to organize your pet supplies. The first is to gather everything together, sort it and then place it in designated spots that work in your home. 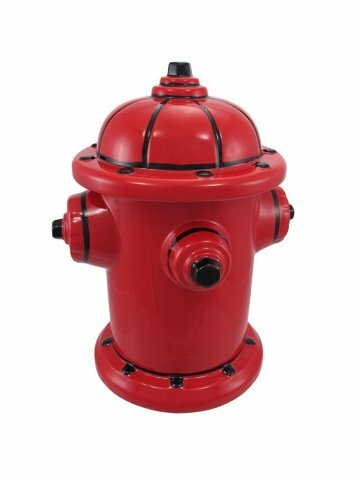 The other is to go where your pet supplies are stored and then clean up and organize where your pet supplies are. They both work! And you should probably use both ways depending on how your things are stored currently. I prefer to collect things all into one place so that I can get a full picture of what I have. 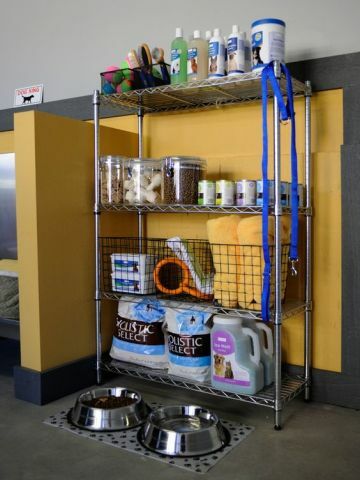 Once you have collected all of your pet things into one place, organize your pet supplies into separate categories that relate to the item’s specific function; for example, a grooming supply section or a pet medicine section. Once you have groups of like items grouped together, then you can find a convenient and easy way to store your items. The most important thing to remember when you are sorting things is that is is hard to organize tons of clutter and you should not do it. If you have dozens on old torn toys laying around or leashes that have seen better days, just keep one or two in reserve and toss the rest out. Once you have gone through your items and discarded things that are too old or not being used, you can see how much of certain items you have. Then, you can find containers that are suitable for the space, and try to make what you have fit in those containers. If things don't fit, then really think seriously if you need to keep what's left cluttering up your home. To help you sort through your items and figure out where to put everything, here are some simple ideas that will help you get organized. 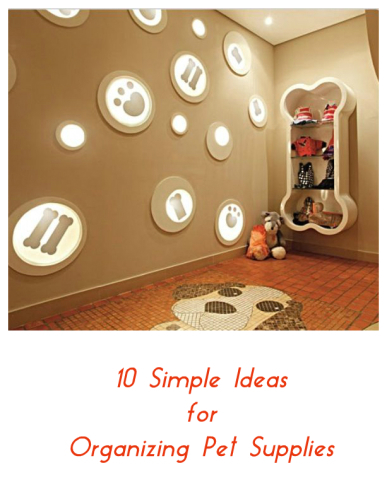 After these tips, take a look at the inspirational ideas for organizing pet supplies and gear. Storing dog leashes can be a pain in places too impolite to mention. They tend to dominate most drawers because they have to be folded. 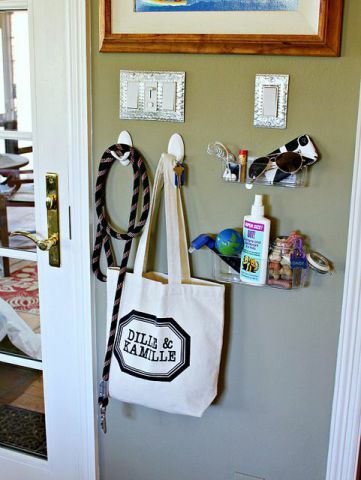 Strategically, near the door is the best location for leashes, harnesses and other related items such as poopy bag holders and maybe even a doggy sweater or two. A tote bag on a hook on the front door or a nearby closet door works well and doesn't require much space. If you have had for a pet for any length of time, you know that the number of toys for your cat or dog tends to add up over time. A good thing to do is to collect all the toys and put them in one large and convenient storage container. 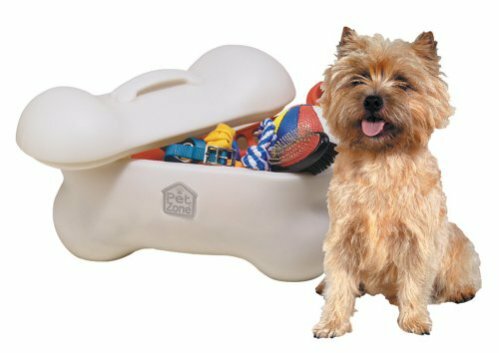 One really cute option for dog toys is this adorable bone shaped storage bin or a large bone shaped basket. You can take toys to other rooms, but having one central location to take things from and put things back makes it easier for you to know what you have and able to quickly see and discard broken toys. Pets like other family members acquire “stuff”, which can quickly overtake your home with clutter if you don't keep it under control. Shelves, like the ones depicted above, help so much because all you have to do to do is put things back where you took them from. So look around your house and see if you can reserve a shelf or cabinet for your pet things. 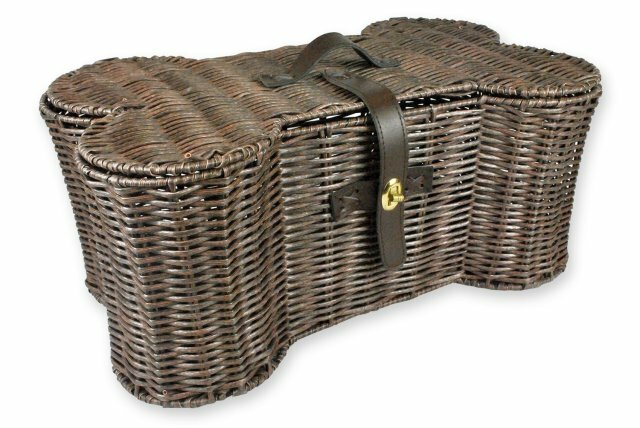 And make sure that unless it is pretty to look at, it is stored away in a basket or container to keep it from cluttering up the look of your shelves. In addition to having a central location for pet toys and dedicated shelves or cabinets in your home for pet things, it is also a good idea to have some sort of storage container for each room holding toys until you can move them back to their central location. 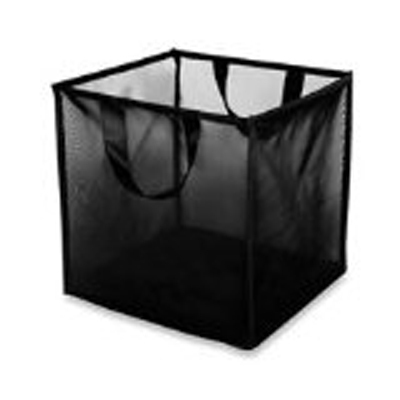 The Lazy Bonezz Mesh Pet Toy Bin is perfect for storing and moving pet toys. Buy more than one, especially if you have more than one pet. 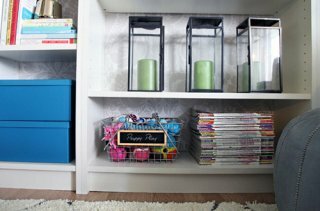 If playtime is in different rooms in the house, buying a few of these means you always have a dedicated spot in each room for toys.And these bins are so light, it will be easy to carry the toys and move them around. Portable caddies are really ideal for organizing all your pet’s grooming supplies. You can get very creative and try different types of containers for your pet supplies. I love portable shower caddies for grooming supplies so I can use the items and then put it away out of sight easily. Brushes and such may fit perfectly into a larger utensil or storage caddy like this one and there are many kinds to choose from. 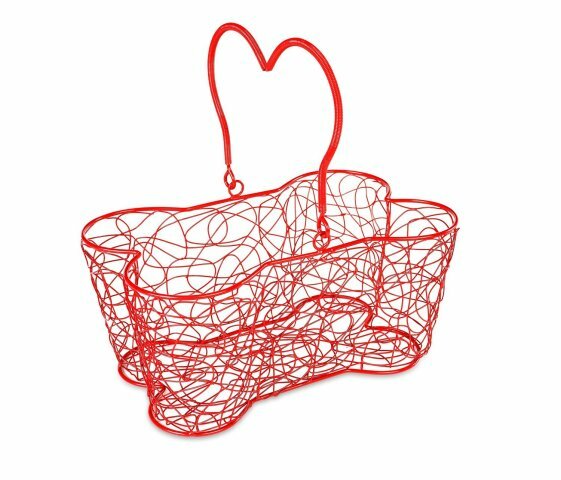 A cute idea is to use a bone shaped basket that is easy to lug around if you can't hide it away. Diaper caddies are also worth considering. Just make sure to look for a wider rather than deeper container when buying a pet caddy. 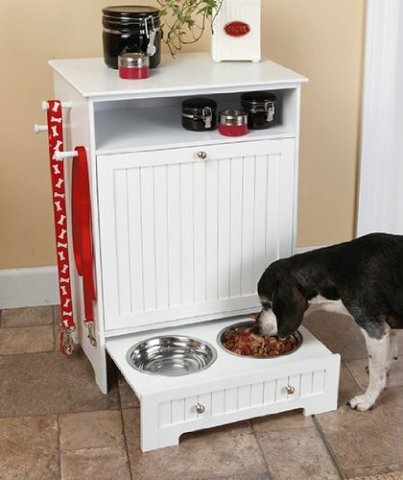 An old cookie jar or even a fancy new one would be perfect for organizing your pet’s treats. Add some decorative labels and voila; Instant treat station. With treats being so accessible, reward times for good behavior are likely to be more frequent. The labels add a nice touch and they also insure that no one will mistake the contents of the jar for some treat meant for human consumption. 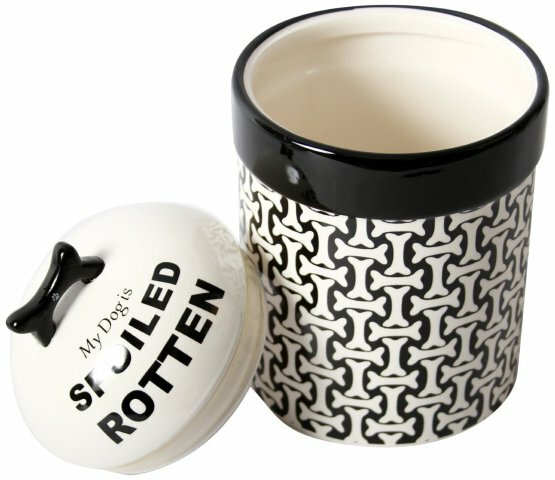 Or you can just get a clearly cute pet treat jar like this one or something really fun like this one. 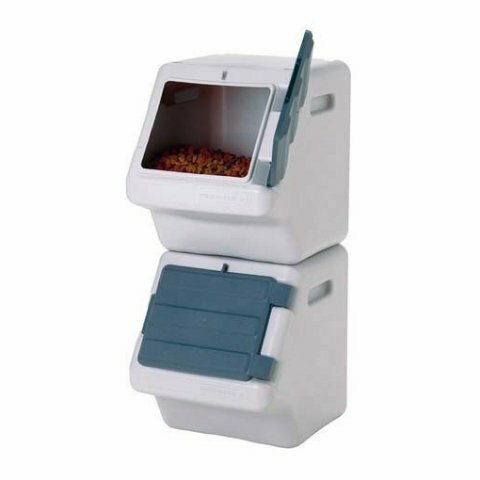 In trying to find the best way to store pet food, the most important goal is to keep your pet's food fresh and easily accessible. Storing dry food in an airtight stackable bins made especially for that purpose like this stack and store solution makes a lot of sense and helps saves on space. Another feature I think is important is having wheels on the containers so you can easily move the containers around and clean around them like the Iris Combo Food Kit. One of the things I found most convenient in our house was to dedicate one cabinet for dog foods and treats. I just used one of my lower cabinets and then used some plastic bins like these inside them to create fake drawers. 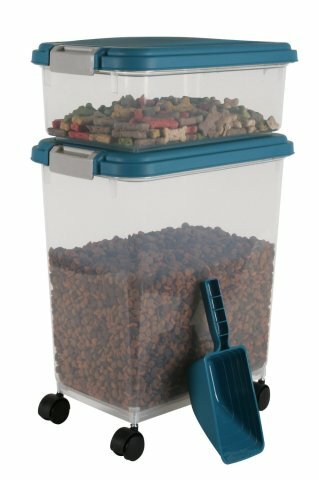 You can then just put all your foods and treats inside the bins and pull out a shelf when you need it. I used the lower shelf for the big bags of food in airthight containers and the higher shelf for treats and vitamins. It's much less expensive than a fancy cabinet tray and so convenient. It's also really easy to keep clean. The best thing is that it keeps the clutter hidden behind a cabinet. Food and water bowls seem to always be in the way of traffic gong in and out of the kitchen area. They are not only clutter. They are also obstacles easy to knock and trip over. Find an area with less traffic if you can. In some cases, a laundry room might work; in others a quiet corner in the basement or a back room you may not use every day. Give it some thought and you will find a place that will work. 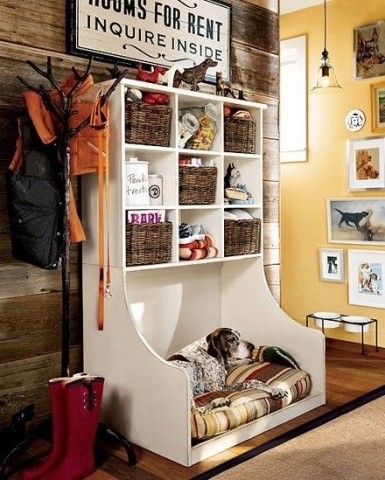 Consider too an organized feed station or even an more organized dog feeder to minimize clutter underfoot. 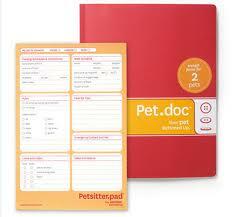 Keeping your pet's vital documents in an easily accessible place can sometimes be a matter of life or death. The Buttoned Up Pet Agenda allows you to create a file for each pet containing all pertinent information, such as food, medications, sitters and favorite toys. If you need to leave your pet with others, everything they need to know is in this one notebook that has provisions for up to two pets. Of course, you can also make your own pet folder or organizer - just put all the info you need for your pet in one portable folder, binder or notebook. 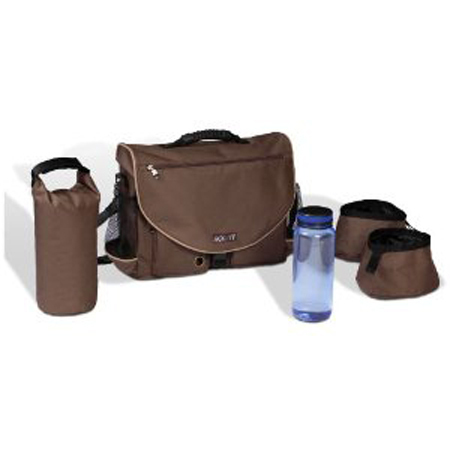 Organizing pet supplies as well as anything else in a home requires cooperation of everyone who lives there. But if you take the time to collect and purge out what you really don't need and then set up clear and well defined areas in your home for your pet supplies, it will be easier for everyone in your home to put things back where they belong. 1) throw things you don't need out. 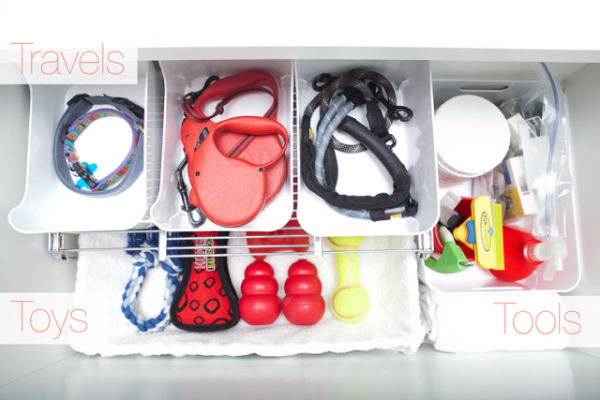 Organizing the stuff for your pets will definitely make your life better. 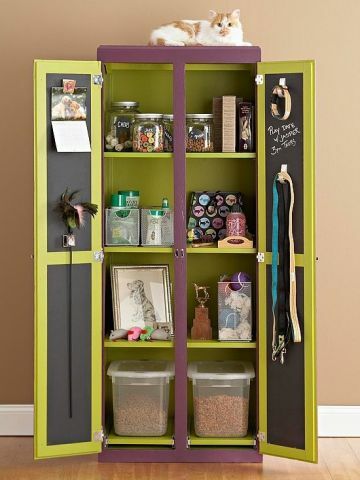 So make the extra effort and organize your pet supplies today! Originally published May 2014 and updated April 2016..